Colder temperatures, shorter days, and snow bring a slower pace to one of the nation's most visited national parks. Winter visitors find paths less travelled throughout the park. Those prepared for ice and snow will find the Bright Angel Trail a bit quieter and scenic drives less congested. Dramatic winter storms, bringing several inches of snow, are contrasted with sunny days, perfect for walking along the rim or into the canyon. Crisp air and a dusting of snow bring a new perspective to the temples and buttes emerging from the canyon floor and provide a perfect backdrop to view the canyon's flora and fauna. Mule deer traipsing through fresh snow and bald eagles soaring above the canyon rims are just some of the wildlife spotted during winter. Many animals slow down for the winter and are seen less frequently, but there is still a chance to see elk, California condors, ravens, and Abert's squirrels along the rim and in nearby ponderosa pine forests. Most animals in the park have developed some sort of adaptation to the cold weather. Rock squirrels, frequently seen along the rim during summer months, spend the fall caching food and preparing for the cold winter. Although they spend much of the winter in their burrows, they can be spotted along the rim during warmer days. Mule deer and elk grow thick winter coats to deal with the low temperatures and the Abert's and Kaibab tree squirrels grow fur tassels on their ears to keep out the cold. 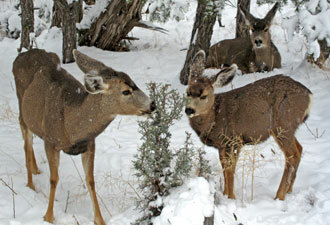 Just like the animals who make their home at Grand Canyon, visitors should slow down and bundle up. Winter is a perfect time to enjoy a warm beverage along the rim, or view the canyon from inside the Yavapai Geology Museum, where panoramic windows provide crisp views from inside a warm building. The South Rim of the park is open year round, and roads are drivable except in inclement weather. Weather changes quickly at Grand Canyon, and so does visibility. Planning a visit for multiple days allows visitors to experience some of these changes, and provides a good chance for a great view of the canyon. Winter solitude blankets the North Rim of Grand Canyon, which is closed to vehicle traffic during the winter. Hikers prepared for a multi-day canyon adventure can walk from the South Rim to the North Rim for a winter camping experience in one of the most inaccessible locations in the country. Locations inside the canyon, like the Phantom Ranch lodging facility and Bright Angel Campground, offer mild temperatures in winter, and backcountry permits may be more easily obtained during the winter months than during peak hiking seasons. 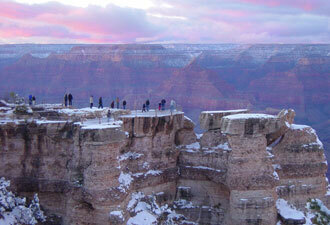 A trip to Grand Canyon can be a great winter getaway, especially with careful planning. The Grand Canyon Trip Planner is a great place to start. 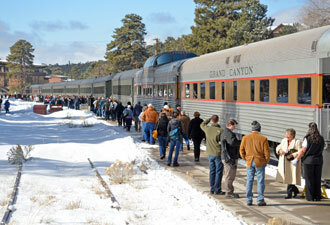 Pack your jacket and winter gloves, avoid the crowds, and come experience a Grand Canyon winter wonderland!